In terms of revenue, the software segment is the most attractive segment in the global event management software market and is expected to reach a market value of more than US$ 5,000 Mn in 2017. This segment was estimated to account for more than 60% revenue share in 2016, and is projected to be valued at more than US$ 10 Bn by 2026 end, accounting for a revenue share close to 70% and registering a CAGR of 12.4% over the assessed period. The segment is expected to create an incremental opportunity of a little more than US$ 10 Bn. Companies are adopting event management software solutions for event marketing, venue management, catering management and others. The software segment is anticipated to register significant revenue growth due to high adoption of professional services by corporate companies. Event management software aids in enhancing workflows by maintaining a record of large data volumes and supporting organisers in planning, coordinating, sourcing and analysing data and information to ensure a successful event. Event management software automates processes such as ticketing, venue sourcing, expense tracking, floor planning, etc., thus streamlining the overall event management process. Event management software also allows event organisers to send and track invitations of attendees from a portal where these individuals have registered themselves, and also monitors and tracks ticket sales, all on a single platform. The enhanced benefits of event management software is the main factor boosting the adoption and growth of the software segment over the projected period. Social media platforms are emerging as one of the most popular mediums for marketing and promoting events, campaigns and social causes etc. The software segment supports the registration process for potential attendees visiting the respective page on Facebook. Once the registration formalities are completed on the supported page, the event management software generates an e-Ticket, which is then sent to the registered individual’s smartphone. The e-Ticket can be shown at the venue, and entry can be obtained after payment formalities are completed, either online or in cash. Convenience and ease of this process is a major factor driving adoption of the software segment. Rising adoption of cloud-based solutions owing to easy accessibility and cost-effectiveness is contributing to the growth of the software segment. Cloud-based event management software enables easy and affordable access to event information from anywhere at any point of time. Furthermore, cloud-based event management software also helps to quickly fix any errors or system bugs. As cloud-based event management software can be accessed from anywhere, this offers dual advantages as along with enhancing customer experience it also enables event organisers to access the operational information if and when required. Cloud-based event management software also helps in cost reduction as it negates the need for on-premise IT infrastructure upgrade. These factors are creating robust development in the software segment of the global event management software market. Revenue from the software segment in the North America event management software market is expected to increase at a relatively high CAGR over the forecast period. In this segment, the event planning sub-segment is expected to increase at a high revenue CAGR over the projected period. On the other hand, the professional services sub-segment is anticipated to grow at a high revenue CAGR over the forecasted period in Latin America. In the APEJ region, revenue from the software segment is expected to increase at a high CAGR owing to growing adoption of venue management and event marketing solutions in the region. 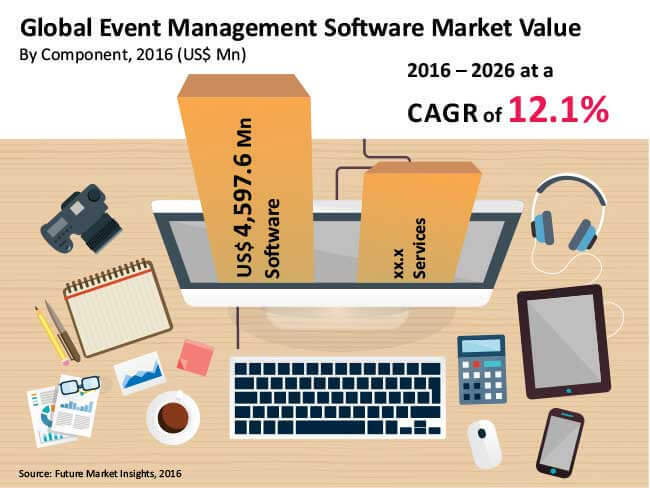 The software segment in the MEA event management software market is expected to increase at a relatively high CAGR due to high adoption of software for event planning, online registration, online event organising and others.